Results Orientation: What Does It Look Like? Ask staff to reflect upon the individual(s) who were the most meaningful in their lives as they were growing up. Distribute the circle cards. Ask staff to select the circle card symbol card that best represents their circles of support, and then pair up. In pairs, staff will share who were the individuals that made up their circle of support -What were their characteristics and qualities? How/why has their circles of support changed as they developed and evolved into adulthood? Close with a large group share out. Tell me what they say. Do they tell you my future? Can you see the tears I cry? Well what about the pain I hide? Or is it you just don’t care what’s inside. is the fake me I have to be. A group of teens that participate in the afterschool program at community center X have expressed an interest in fashion and clothes. Many of the teens come from low-income families and can’t afford new clothing. The program director sought out older women in the community who knew how to sew and would be able to teach the teens. Through flyers, word of mouth and social connections, some of the parents or grandparents came forward to volunteer. Teens who participated in these workshops learned new skills, connected the elders in their community and showcased their items in a fashion show, where the elders were celebrated. Develop a kinship care support group that provides grandparents with the opportunity to minimize feelings of isolation by helping them develop a network of support among peers. The support group also provides a space for grandparents to reflect on their generation, their changing role in the family and their influence on the lives of their grandchildren within a safe and supportive environment. Keep in mind that you must recognize the special needs of grandparents and be sensitive to their cultures, values and traditions. Understanding the ways in which grandparents perceive their roles, their expectations of themselves and their grandchildren, and their perceptions of services is fundamental to effective involvement. Grandparents are important assets to your programs because they often have time, a broad range of skills, and unique perspectives to contribute. Family conferences need to take place regularly. It is helpful to schedule them at a given time, perhaps at the same time each month. However, if this is not possible, they at least need to take place when the caregiving situation or other situations in family members’ lives change. Holding regular meetings allows more time for processing of information and decision-making. When a family member is unable to attend a meeting, he/she can keep in touch by phone, mail or email. What does the person who is ill want and need? Who else in the family can help out with the caregiving responsibilities? Who will make decisions (e.g., financial, medical, hiring a caregiver, etc.) and how will they be made? What sort of support does the primary caregiver need? How will the caregiving and support needs change as the illness progresses? Don’t worry if you are not able to cover all these issues in one meeting. Regular check-in meetings can be used to address issues not discussed. Be sure to stick to the meeting time table; if meetings are too long, fatigue sets in, minds will wander, and people may resist coming to future meetings. Seniors’ Night Out: – A local community program organizes a play and dinner dance for a group of seniors at the local high school. Dinner and the play create an enjoyable night out and connect seniors to the community. Seniors’ Expo: –The expo shares information and resources that can help families to care for their aging parents or other elders. It can showcase many community organizations that families are not aware of. Involving youth with seniors can be a rewarding experience for both as they share interests from such different perspectives. Adolescents who may have trouble connecting with parents sometimes relate better to older adults. Swapping stories can help build a connection. Learning skills. Many older adults have skills or talents that are interesting for children and youth. Perhaps program participants could learn to quilt, crochet, knit, woodwork, scrapbook, fish, bake, or take care of animals. Establishing phone pals. This activity can connect older community members with children who are alone after school. Talking about ethnic heritage. Share ethnic customs, discuss the meaning of a name in native language, or relate special stories passed down about culture. Planting seeds or gardening. A container garden can be created if bending or space is an issue. Discussing hobbies and sharing examples. What resonated for you as you watch this video? How is Ka’ek’e story similar to the young people you work with? What are some of the challenges you face in connecting your young people to their circles of support? How would you develop Ka’ek’e’s circles of support plan? Distribute the circle cards found in the communication section of this toolkit. Ask young people to reflect upon the individual(s) who are most meaningful in their lives. Ask young people to select the circle card symbol card that best represents their circles of support or what it should be. In pairs or small groups, ask young people to share who makes up/can make up their circles of support. What are their characteristics and qualities? How can they begin to identify these individuals? Or What changes would they make to their circles of support? Why or why not? Take a moment to read The Struggle to Be Strong: How to Foster Resiliency in Teens – Learning to Forgive story. This short story is about Christopher’s struggles with the relationship he has with his mother. It also illustrates how an adult in a young person’s circle of support, can encourages forgiveness and help strengthen the mother/son relationship. Do you think Christopher is realistic about what he can and can‘t expect from his mother in the future? What’s your role in connecting RHY with their circles of support? What gets in the way of helping young people improve the relationships with their family (keep in mind that family looks different for each young person)? What supports/resources do you need to be better at connecting young people with their circles of support? What Do You Know? is an award winning thirteen-minute film produced by Human Rights Campaign (HRC) for elementary school educators and parents/caregivers. The film features students from Alabama and Massachusetts discussing what they know about LGBTQ people, what they hear at school and how teachers can help. The students offer thoughtful, poignant commentary on their experiences in school with LGBTQ topics and show that students already know about and want teachers to discuss LGBTQ issues in the classroom. Which of the students’ experiences most resonated with you? Why do you feel that way? What helped the students interviewed in the film, who were being called names (gay, fatty, stupid) resolve those situations? When the students spoke about being bullied (being called names, made fun of) how did that make you feel? What would do if you were in that situation? “So gay” was used interchangeably with something wrong or messed up. What do you think about the students responding that teachers don’t address this at school? Are these comments or others like them made by the participants in your program? How do you address this happening in the program? How does your family (or the family you are working with) address situations like these? What helps address the emotions that go along with these situations? What is their support system?Are there other resources they could benefit from? How can you help support your LGBTQ family member who are facing similar challenges like the students in the film? Meet Q a nine year- old transgender boy from Brooklyn. In this video, parents of transgender children discuss their tips for navigating gender identity and supporting a child when s/he comes out. How does the family deal with having a child who identifies as transgender? Are there positive or negative feelings about their child’s identification and actions? Where do you see the family being supportive of their child? How do others outside of the family treat the child? How different is it from your experiences? What do you notice about the child? Are there any social/emotional issues the child experiences as part of his gender identity? What moments were most significant or touching to you? Why? The videos described below provide both staff and families with a better understanding of the feelings and struggles of LGBTQ youth and their families’ experiences. It’s important to process the videos with staff and families as they deal with sensitive topics. Use the guiding questions below to debrief the videos and process any emotions and feelings that emerged while watching the video. What were your impressions about the father, his background, and his values? What were the challenges he faced with his own value system? How did he address that conflict? What helped him? Have you had similar emotions when having to choose between two important issues (or people)? What helps you to resolve difficult conflicts? How do you address the people you have conflicts with? Have you ever found yourself to be in the position to advocate for your child? What was it about? What was the experience like? Do you have conversations with your own children (the participants, their families) about topics regarding sexuality? What would be helpful to foster these conversations? Jennifer Finney Boylan, co-chair of GLAAD and author of She’s Not There: A Life in Two Genders. • Connecting their child with an LGBTQ adult role model to show them options for the future. It is also important for youth-serving agencies to enhance their cultural competence in working with LGBTQ-headed families, which are increasing in number.9 Youth who are not LGBTQ but have an LGBTQ caregiver may also experience bias and other negative outcomes because of reactions to their caregiver’s LGBTQ identity. Print and post DYCD Principle Statements on LGBTQ Youth around your program to identify yourself as an ally for LGBTQ youth. Visit www.familyacceptanceproject.org for additional resources for how to engage families of LGBTQ youth as partners. Seek out organizations that already have a high level of male involvement, such as sports, clubs, fraternities, religious institutions, and community centers. Distribute information about ways for fathers from the community to be involved in the program as role models or mentors to support the healthy development of male participants. These organizations can host events at their meeting places to involve men who may feel uncomfortable visiting the program. The videos below provide great information for staff on how to engage fathers and can also be used in the program to get fathers involved in sharing what’s important to them. The videos below were created by the Child and Family Research Partnership (CFRP) at the University of Texas at Austin: Fathers’ Perspective on Fatherhood Programs and Fathers Matter for the Whole Family. This powerful video of how one prison program in Richmond, Virginia is helping daughters and their dads strengthen their relationships. This is Life with Lisa Ling shares the emotional experience of covering a father-daughter dance in jail. What is helping build the bond between fathers and daughters? Where do you see that in the film? What moments were most significant or touching for you? Why? What else could have added to the experience? What would help the fathers stay motivated to keep the promise to their daughters? Welcome fathers and are comfortable with their inclusion. Are persistent and creative in recruiting and involving fathers. Consult fathers on content, design, publicity, recruitment, timing and venue. Are built around father-child activities. Help fathers with their own needs and parenting roles. As a team, use the National Fatherhood Initiative (NFI) Father Friendly Check Up Tool to examine how your program’s current structure/practices engage fathers. This process will help you learn a little more about your program’s foundation and capacity to build a successful father engagement initiative. Remember, that without a strong foundation and practices, your program runs the risk of not being able to effectively serve fathers. What are fathers saying about their parenting role? How does society view fathers? What do fathers need to be successful? Many undocumented immigrant families are afraid of deportation. Facilitate an informational session Know Your Rights (Spanish here), to help families be aware of their rights and what options are available if they are apprehended by ISIS. To engage and support immigrant families, program staff must employ a variety of strategies that respond to their experiences, strengths, challenges, and cultural beliefs. Recognize that immigrant families face similar and different challenges. Assess the families’ paths to immigration and identify specific related needs. Broaden your outreach strategies beyond making phone calls; sending flyers and hosting events, and include making home visits to expand your reach to families who are hard to engage. Be alert to the value of extended family and other types of relationships. Provide a variety of learning opportunities that address the needs of immigrant families. Hold a picnic or other similar event for families with ELL students at the beginning of the school year where they can meet staff and other families. Create a welcome DVD in multiple languages. Provide staff with professional development opportunities to learn about the cultures of families in your program. Conduct neighborhood walks that expose immigrant families to other institutions and services in their community, i.e. libraries, financial institutions, schools, municipal services, other CBOs and/or DYCD programs. Provide food and free childcare during family events. Provide opportunities for immigrant families to tell their stories. Use collaborative community media such as radio and television stations to conduct outreach and build relationships with community businesses where families frequent and have relationships. Engage diverse and respected community leaders to help bridge the cultural, language, and generational differences. Create an “ambassador” program in which participants and parents/caregivers are trained to give tours of the program. Create a centralized welcome/intake center that is managed by bilingual staff. Put together a “welcome kit” that includes key information, such as basic program policies, events and educational activities for families with ELL students. As soon as they enroll, connect each new family with a contact person who speaks their language and can provide them with guidance and information. You are familiar with the individual’s story. The story will help inform the public about family leadership and the mission at hand. You know how much (or how little) your spokesperson wants his/her face, name or voice used publicly, particularly on television. S/he understands the possible effect that speaking out publicly can have on family members, especially children. The spokesperson is comfortable talking about his/her story. S/he is at ease when speaking publicly. S/he is prepared to talk to the press or other external stakeholders. The spokesperson understands his/her role. The following strategies and techniques can help you recognize the members of your family advisory committee. Even the smallest gesture of appreciation can keep members motivated and passionate. Below are some ways to celebrate your family partners. Publicly recognize members by name and introduce them at meetings. Send home personal letters of appreciation to each member after advisory committee events or when project goals have been met. Award members a framed certificate of appreciation or plaque at the conclusion of the program or their service terms. Recognize throughout your organization the contributions of advisory committee or subcommittee members. Invite members to program events such as student banquets, competitions, or graduations. Display members’ names on a plaque in the lobby, main office, or another central location of the organization/school/center. Recognize members at staff meetings or Board of Directors’ events. Invite members to occasional Board meetings to meet and greet and share progress. Organize an annual lunch or dinner for the committee to celebrate, socialize and bond. Feature short profiles with photos of individual members in the agency newsletters or social media such as Facebook, etc. In developing the family advisory committee, you may want to designate an individual who can serve as the spokesperson. This can be the chairperson, but they may not have the time or comfort level to constantly speak in public. Often, a spokesperson can be someone who has a story to tell that is relevant to the work and mission of the committee. You may want to have rotating spokespersons (as with your chairs) to keep the energy flowing and include a variety of personalities. Develop a draft agenda prior to each meeting and consult the chairperson for input. Meet regularly to establish working relationships and accomplish work plans. Translate agendas and other materials into appropriate languages if needed. Follow up on recommendations from members and communicate updates and results to the committee at each meeting. Avoid asking members to complete work that can be handled by program staff. Keep members informed of current and pending legislation affecting your organization’s funding or capital plans. Send reminder announcements of meetings one month in advance and again one week prior to the meeting. Send agendas out two weeks in advance of meetings and call or email members the day before the meeting. Ensure meetings do not last more than 90 minutes. Use agendas effectively. Disseminate minutes within two weeks after meetings. Provide members with current committee rosters. Keep rosters revised and current. Replace inactive members. Ask current members to recommend new members. If issues that require immediate attention arise, meet individually or with at least two or three members at a time. Keep the committee active. Continually solicit and consider its advice. Publicly recognize and thank committee members. Here are some tips to help you get started with your family advisory committee. Begin conversations with fellow staff and family members informally, mentioning your idea as something exciting that’s “up and coming. Discuss the advisory committee in more detail with 4-5 families who seem motivated and ready to volunteer. Invite this core group to an initial meeting to plan next steps such as a calendar and topics or concerns to be addressed. Work off the Family Self-Assessment Survey to help families determine their readiness to commit to the committee. Set up a series of regular monthly meetings, choosing an initial time you believe is convenient for your core group and others. Choose dates that are easy to remember, e.g., the first Thursday of the month. Create a flyer advertising who, what, where, when, and why (See Sample Invitation Flyer and Letter) and ask your core group to help disseminate it among other families. Advertise on your CBO’s website. Send text alerts to families. Start a Facebook group about your new advisory committee. Ensure that the family advisory committee gets a shout out at all events and workshops run by your CBO. Ask your core group to make phone calls to other families to encourage their attendance. Give visibility to the advisory committee in your agency newsletter. Start and end on time. Though your advisory committee may start out small, it can grow quickly as word spreads. You may consider capping it at 15-20 or fewer depending on your capacity. Consider adopting a small project or concern to address immediately so that the group can see success and gain traction. This will help with further recruitment. Have at least one parent or caregiver act as a chairperson to run the meetings and help follow-up with logistics. Remember you are working toward a true partnership. Feel accepted, encouraged, and supported by other parents and professionals. Are recognized for their successes and contributions. See other parents like themselves taking on leadership roles. Helping to develop the skill set for families taking on leadership roles will keep them engaged and provide them with the tools and knowledge they need to be successful. Below are a few ideas to consider. You may also request training themes from your advisory committee. Schedule sessions that are one to two hours in length at a time when families are available. In advance of the session, create five or six focus group questions. See Sample Focus Group Questions. Provide childcare during the focus group. Hold sessions in a space that offers few distractions. A community conference room or library meeting room is ideal. Provide refreshments, particularly if families are coming from work to participate. Provide name tags to facilitate communication and help build community. Create an agenda that includes the following items: welcome, review of goal of the meeting, review of ground rules, introductions, focus group questions and responses, and wrap up. Determine how you will record the session. If note takers are not available, arrange for audio recording. If you audio record, make a plan to have the recording transcribed. Emphasize that although families will only be spending one or two hours together, they will be contributing to a much larger effort that can make a difference for all the program’s children, youth, and families. Respect participants’ time; begin and end on time. NOTE: Follow-up is key. Taking the information collected through the focus group process and making it actionable are integral in developing the relationships with families. Create a family suggestion box where families can anonymously, or by name, share their ideas and suggestions for continuous improvement. You can either purchase a beautifully decorated box or involve your families in creating one, deciding on where it should go and how the suggestions will be reviewed. In what area do you feel this idea can help? Please circle or check all that apply. Family Engagement – Workshops, Events, etc. 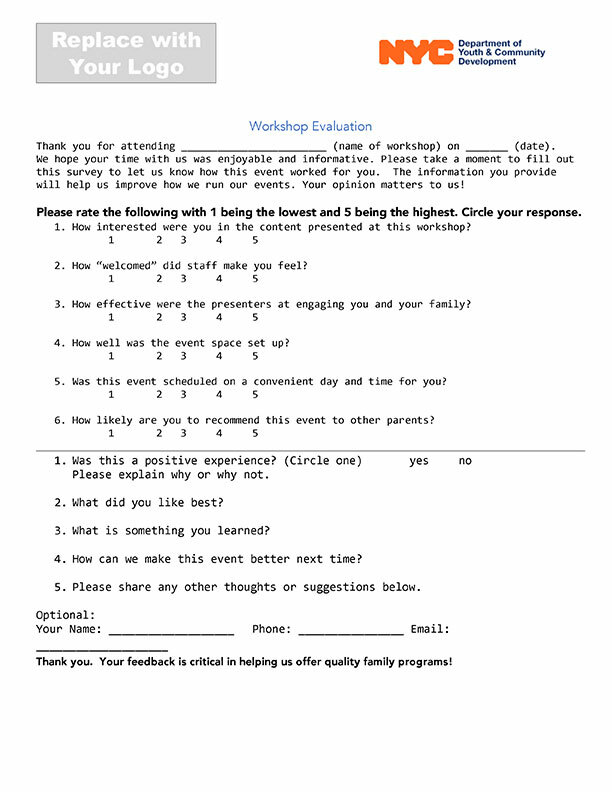 Conduct a quick evaluation to gather feedback after any family engagement event. Use the data you collect to incorporate changes that will make the event stronger the next time around. Here is a sample evaluation you can adapt for your workshops or other events . Use a simple survey to gather feedback from parents and caregivers who attended your events over the program year. Incorporate good suggestions into your future programming and share the notion that great ideas come from your families and you want to hear more! Focus groups are another way to include families in the service delivery process. They may be conducted as a follow-up to a survey or as the primary means of soliciting parent input. Focus groups usually involve six to ten people. Within this small group environment, it is possible to obtain a great deal of information in a short period of time. Organize an annual lunch or dinner for the committee to celebrate, socialize and bond.Feature short profiles with photos of individual members in the agency newsletters or social media such as Facebook, etc. Set up a series of regular monthly meetings, choosing an initial time you believe is convenient for your core group and others. Choose dates that are easy to remember, e.g., the first Thursday of the . 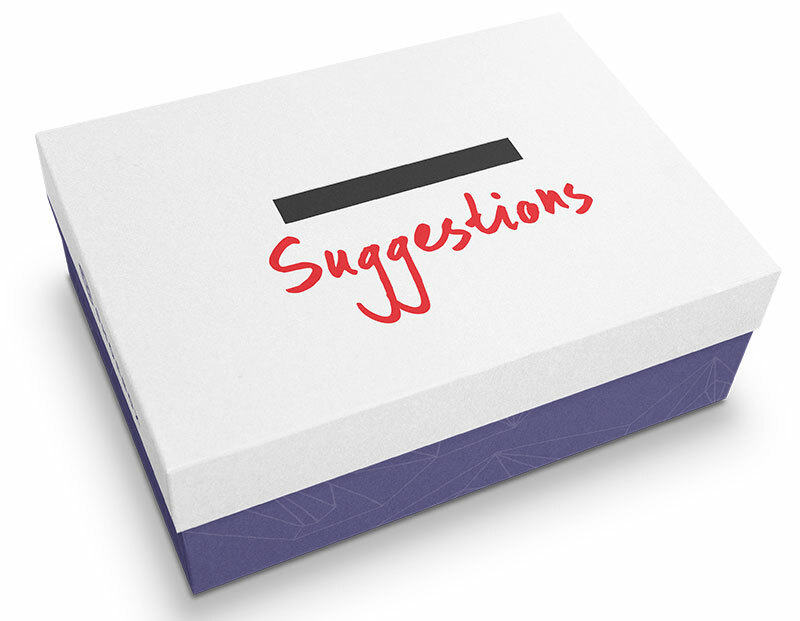 Can the designer create a visual of the suggestion box and card? How Are We Forming Partnerships with Families? Take time throughout the program year to assess what you are currently doing to develop family partnerships and identify how to move your program toward a deeper level of engagement. Use the Listening To and Forming Partnerships with Families Self-Assessment Tool with your staff, families and partners to develop strategies to address the areas in need of improvement. Remember that improving program quality, practice, and culture is not an easy task and takes time. When developing your action plan, select two or three changes you would like to pursue. After an Instagram incident, a group of 8th graders were given an opportunity to express their feelings and create a plan for restoring the break in trust, faith and respect. The program director proposed to the school’s principal restorative circle activities in place of detention. Participation in the circle activities was voluntary. The young people were introduced to the restorative circles expectations and were asked to provide feedback about what kind of restorative process they would like to have. The week-long restorative circles focused on conversations about harm, personal responsibility, and trust; and incorporated individualized reflections and research projects as part of the process. At the end of the week, families and administrators were invited to a reintegration circle in which, together, they created a plan for the students’ reintegration to the school community. Gain awareness of their own attitudes and behaviors toward the families they serve. Explore different perspectives from the point of view of families. Role plays or group discussions around hypothetical situations are great strategies to help staff explore differences in opinions and cultures. Recognize the many opportunities of engaging families as partners. Engage with families through a variety of modalities. Take time to process with others about difficult conversations or situations. Meet families where they are. Build skills sets with families. Encourage families to build on their own experiences. Vocal –– They spend time talking with staff before, during, or after events and workshops. 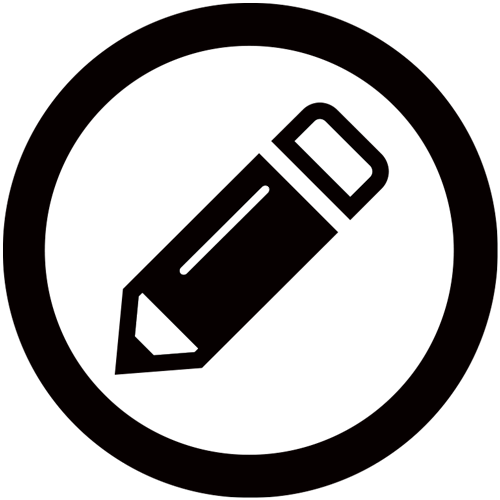 Present – They participate often in workshops and family events. Advocates – They speak up and encourage other families to do the same. Open to Giving Feedback – They participate in focus groups, agency surveys and other evaluations. Contributors to the Program — They like to share their experiences, knowledge, and expertise with staff and participants. Creative and Idea Driven – They recognize the need for growth and change. Active in Their Community – They participate in other advisory committees in the program and community. Role Models for Other Families – They motivate for positive action. Family leadership develops over time as families share ideas, link with neighbors and community groups, participate in workshops and connect with policy makers. Below are some of the ways families develop leadership skills. Families learn leadership through their children: Families take charge of unfamiliar situations and assert their rights to be decision makers for their children and other family members. Families learn leadership skills from other families: Family leaders look to one another for validation, support, information, skills, and recognition. Families learn leadership skills within their communities: Families build leadership skills as they participate in family-to-family network meetings, informal conversations, workshops and training programs, planning sessions, and advisory meetings. Families learn leadership skills by getting involved on a systems level: Families build leadership skills by accepting leadership roles and being active participants in systems level change. Building the Collective Capacity to Engage in Authentic Partnerships: Programs must prepare families for leadership opportunities by building their capacity to collaborate and share decision-making. Working from a holistic perspective requires programs to design supports and services that build on the strengths and needs of families. It is important that programs hire a family focused staff that is sensitive to and reflects the population served. According to the Partners In Education: Dual Capacity-Building Framework for Family–School Partnerships, programs must build the capacity of staff to make deliberate efforts to connect with families and forge authentic partnerships, at the same time as building the capacity of families to do the same with staff. Adapted from Georgia Department of Education School Improvement, GADOE.org/school-improvement. – Dr. Joyce Epstein, John Hopkins University. Families may seek to partner with your program for a variety of reasons. Sometimes families are motivated to help improve the programs in which their family members are currently enrolled. Or, they may wish to help other families meet challenges similar to their own. Some families feel a strong need to “give back” to the community. Family engagement is part of your program’s identity and culture. It is embedded in your program’s policies and decision-making processes and in the everyday behaviors and attitudes of your staff. Creating a family engagement roadmap can help you keep on track. As you begin to design and enhance your family engagement efforts, engage your staff and partners in assessing current strategies and developing a shared vision and goals for the work ahead. Use the Family Participation Assessment Tool to guide your reflection and inform your family engagement roadmap. Facilitator Tip: Remember to create a safe space for the staff and partners to share ideas provide feedback and think outside the box. Use chart paper, markers, photos, and videos to provide a visual of your vision, ideas and expectations to support the execution and sustainability of your program’s family engagement efforts. Create meaningful shared experiences: Design program activities that will bring participants and their families together to have fun, strengthen connections and appreciate one another. Positive shared experiences will motivate families to come together again. Respect cultural differences: Don’t assume–if you don’t know, ask. Diversity goes beyond race and may not always be visible. It also exists in generational differences, migratory experiences, beliefs and opinions, lifestyles, regional connections, linguistic skills, and ability levels. Create opportunities for volunteering: Volunteering provides opportunities for family members to contribute by assisting in a program, event or activity. Before assigning tasks, assess the family members’ strengths and interests and involve them where they will be most comfortable. Assess literacy levels: Many families do not speak English or have differing levels of literacy, even in their own languages. Take this into consideration when planning activities. Whenever possible, include a staff person who speaks the same language or an interpreter. Using numbers, symbols, pictures or music can help families with low literacy levels, visualize what they need to know or do without feeling embarrassed or uncomfortable. Recognize the needs of persons with disabilities. It may be necessary to adjust activities to facilitate their participation. Consider the physical environment: Ensure that the physical space fits the planned activity. Provide a welcoming environment by displaying a diversity of families through pictures, providing comfortable furniture, offering beverages or snacks, etc. Invite families for an informal breakfast. Share program details and participant highlights. Help introduce family members to one another. Incorporate icebreakers or other fun activities at the beginning of meetings and workshops. During the Creating the Welcoming Family Environment Workshop, the National Center for Community Schools (NCCS) polled practitioners from DYCD’s portfolio of programs to capture evidence of what successful family engagement programs look like. There is higher attendance during meetings and family events. Smiles, hugs, and warm and friendly welcomes are shared with participants. Body language is relaxed and communicates positive messages. Acknowledgements, positive reinforcement, positive language, and laughter are heard. The program environment is friendly and calm. Families are engaged with staff. The environment is bright and colorful. Families have a voice in the program; they are involved in decision-making and leadership. Programs and services are aligned with the needs and strengths of families. Appreciation of different cultures is evident. Words of gratitude are often expressed. Families are responsive to phone calls and emails. Staff represents the community served. Cast a wider definition for “family” to include significant others in extended family or contacts close to the youth or family. Create dedicated spaces for family events, workshops, meetings, etc. Make spaces family-friendly (posters, photos of family activities, artwork, etc.). Tap into the interests, strengths, and needs of your families. Partner with community organizations and businesses that engage with families. Identify some of the families’ favorites such as: radio stations or local newspapers; favorite leader in the community; favorite places to eat and shop; hair salons and barbershops; wellness practices; to inform your family outreach and recruitment strategies. Make sure materials are culturally responsive and address the language needs of your families. Establishing positive and trusting relationships with families takes time and effort. A family liaison can make intentional efforts to connect with families, learn about their strengths and needs, provide information about available resources, and inform the program’s family engagement efforts. A staff person, family member, or volunteer can serve as a family liaison. Based on the population served, what characteristics will your family liaisons need to be successful? What structures are needed to support your family liaisons? What trainings and supports will be needed so that your family liaisons have a common language and approach to engaging and supporting families? Learning about a family’s interests, hobbies, and talents will help you design engaging activities. Make a concerted effort to be in the community as often as possible to get to know families and help them learn about your program and staff. Here are a few ideas to help you learn more about your families and community. Host a meet-and-greet event in a local park. Participate in or organize community events. Attend community board or block association meetings. Display your brand/materials at community and school events. Use the Family Interest Survey Tool to gather information about what families need and want. Using the Communication Mode Checklist assess the communication strategies in place and critique them from the lens of your families. Once you have completed the checklist, use the following questions to discuss your observations and identify areas of continuous growth with your team. What messages are families receiving? How can you make it better? Are there program written materials (brochures, letters, and flyers) that you need to upgrade? What actions need to be taken in the next 30 days to strengthen your communication strategies? Your first communication should always be focused on an area of strength. Families want to feel heard and understood. Families want to hear how and when their suggestions or concerns will be addressed. Communicate the purpose of the meeting? Provide a relaxed atmosphere and establish rapport early? Provide opportunities for families to express their viewpoints? Begin by communicating something positive? Share my expectations and listen to their expectations? Restate what families stated or asked? Remain alert, attentive, and respond appropriately? Use nonjudgmental and supportive language? Use appropriate and easily understood language? Adapted from Family Friendly Schools, “Improving Family Engagement with Effective Communication” Checklist for Verbal Communication. Families think that their child or adult family member is the most important participant, and thus their concern(s) should be the highest on your priority list. Families need to hear what their family member is doing well. Your first communication should always be focused on an area of strength. Families want to be viewed and treated as partners in creating solutions and developing their families and communities. Is there an old storage space not being utilized that can be converted into a family room? Can you share a space with another program? Is there a multi-purpose room that can be converted into a family room with portable materials and equipment? Take a moment to reflect on how your site appears to families. Using the Creating a Welcoming, Inclusive Environment Self-Assessment Tool, consider your program’s strengths and areas that need improvement before building your approach to engaging families. Engage both staff and families in the self-assessment process. Share strengths, surprises and differences of opinion. Refer to your findings from the self-assessment process. Use the guiding questions below to reflect on your family engagement efforts before building your approach to family engagement. What communication strategies are in place to encourage families to be engaged as partners? How is engagement reflected in the kinds of relationships you seek to nurture with families in your programs? How is family engagement reflected in the opportunities you create for families as partners? Welcoming environments provide families with reciprocal relationships in which not only they feel that they belong to the program, but that also the program belongs to them. As a result, families become active participants in the life of the program, and feel welcomed, valued, and connected to one another, to program staff, and to the program’s activities. Creating a space for families in your program sends a strong message of dedication and commitment to families. Having a safe space for families to learn, share, and create a community is vital to your family engagement efforts. We recognize that program spaces are always at a premium. For many programs, it is a struggle to balance the needs of young people and adults to dedicate a space for families. “Beyond the Bake Sale: The Essential Guide for Family School Partnerships,” by Anne Henderson, Karen Mapp, Vivian Johnson, and Don Davies, 2007. Think of your families and “take a walk in their shoes.” Notice what you see, hear, and feel and consider how welcome you feel. Invite your staff and colleagues on a virtual tour of the program’s space(s). Write down on a graffiti wall what you saw, heard, and felt as you walked through the program spaces. Take a few minutes to conduct a gallery walk and discuss themes, surprises, and any differences that came up for the team. Identify areas you would like to improve and strengthen. Celebrate successes and strategies that are working well. An environment that reflects the local community supports the development of a sense of belonging. When you can see yourself in a space, you feel connected. Displays of participants’ work, creativity, teamwork, and leadership. The sounds you hear have an impact on the overall program atmosphere and everyone’s experiences. As people enter your program and move around the space, what they hear will generate different feelings and reactions. The first feelings you have when you walk into a program will depend on how people begin to build relationships with you. These feelings may be affected by initial interactions or how relaxed the environment feels. As people move around the space, they may notice that different areas create different feelings: while some spaces are quiet and restful, other areas create a sense of fun, challenge, or adventure. Try using all your senses to imagine (or remember) what it is like to be new in the program! What do you see, hear, smell, touch, and taste? What sensory experiences do you want families to walk out remembering the most? This will help you to create a welcoming environment for your families. Adapted from Teaching Strategies Y Chart and Children’s Aid Society, Dynamics of Supervision Managers Institute. Host a Trunk Party to support older youth in your program. A trunk party is a gathering of family, friends and community members who fill a trunk of items a student who is going away to college will need. It is a great strategy that engages the young person’s circles of support in getting them ready for college. Know their Names – what do they like to be called or how do they prefer to be addressed? In many cultures, there is a title of respect similar to Miss or Mr. Remember that male and female roles may be defined differently within various cultures. Know your Families – don’t assume you know them. Not all racial/ethnic groups think or act the same. Don’t judge by appearances or what you have heard. Get some history and learn about them, from them. Think Positive – have the first interaction be about getting to know them rather than about something negative such as their child missed program or was involved in a behavioral incident. Build on Strengths– focus on building on assets of participants and their families versus focusing on problems to resolve. Identify Circles of Support – “families” may include families of origin, families of choice, or just a solid network of support. Develop Capacity- the Dual Capacity Framework developed by Dr. Karen Mapp focuses on the importance of building the capacity of both staff and families so that they can work together. Engage participants in defining their families. At the beginning of the program year, enlist participants in helping you create a plan for how to communicate with their families. If your program serves young people, be sure to involve them in your family engagement efforts. Creating opportunities for participants and their families to have a voice can demonstrate the program’s commitment to their overall well-being. Who are the individuals who take care of you? Who are the members of your family? What places do you like to visit in your neighborhood? Who are the individuals that you connect with if you are involved in a sports team, fitness club, afterschool program, faith-based group, or other community activity/group? Do you have any siblings or favorite cousins? What are your favorite family dishes? Bonus Questions: What is something you want to share about your family, friends, or other adults in your circles of support? This activity can help staff get to know participants and their families. Encourage staff to create their own photo journal and share with participants. This activity is a great way for staff and participants to begin to build relationships. Remind staff not to share personal information. They can keep it professional and share their likes/dislikes. Ask them to also include how their families can be reached, how they prefer to receive information (phone, email, text, in person), their preferred language, and the days and times they are available to talk. Use the Emotional Bank Game to introduce the principle of building trusting relationships with families. This activity simulates the process of negotiating and strategizing; when and where to invest time and effort in relationships. It also emphasizes –positives as deposits that yield high social capital and negatives as withdrawals that deplete social capital or goodwill. After the game, feel free to incorporate scenarios of challenging situations encountered in your work with families and bring the concept of the Emotional Bank Account to life by facilitating a role play of building positive relationships. Highlight strategies identified. Family engagement is everyone’s job. Meaningful communication is critical (written, verbal, and nonverbal). Families should be seen as assets and shown respect at all times. Engaged and supported families recruit other families. Planning and being intentional are key to family engagement. Family engagement is not easy. Be patient … stick to it. DYCD knows the importance of family engagement in helping improve outcomes for all family members and building safer and healthier communities. DYCD has made partnering with families a priority. DYCD staff reflects on the many benefits of engaging families as partners. Practice SpotlightTips shared by practitioners, leaders, and experts based on lessons learned from engaging families. Reflection CornerQuestions and exercises to help identify opportunities for growth and continuous improvement. Try This!Innovative strategies, tools, and practices that can be adapted to strengthen and develop your family engagement work. VideoMedia used to illustrate innovative practices and strategies in action.